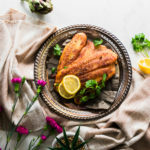 Looking for healthy low carb lunch ideas? 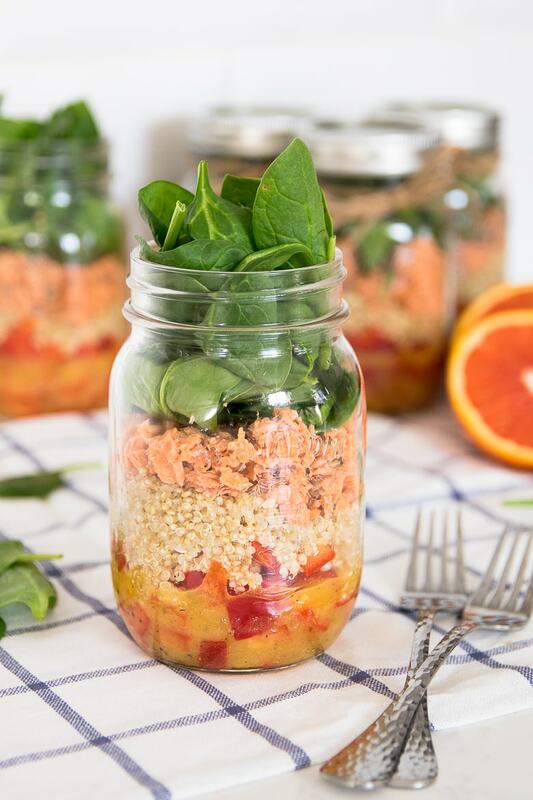 Learn how to make this make-ahead delicious salmon mason jar salad. With layers of colorful vegetables, heart healthy salmon, and fibre-rich quinoa – all made complete with the dressing of your dreams! Super easy, fresh and oh so satisfying! 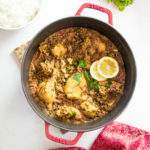 This recipe was sponsored by The Marine Stewardship Council (MSC), a global nonprofit organization that works with fisheries, grocery stores, restaurants, and other companies to change the way the oceans are fished, address food fraud, and make it simple for consumers to purchase sustainable, traceable, wild seafood. I loooovvve making this mason jar salad! And if you’re bored of the same ‘ole lunch every day – shake things up with one of these! 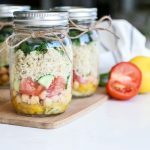 It all started when I made this one – a vegan take on a Mediterranean-style salad – in mason jars. Many of you reached out to me on Instagram and Facebook asking for more. Of course, I couldn’t wait to dive in to create a heart-healthy salad for National Nutrition Month. Why Put Salad in Mason Jars? Because it offers endless possibilities to make lunch count. Not to mention, it can be your prettiest and healthiest meal of the day! Prepared ahead of time. It’s ALL about meal prep – to set you up for success. A bit of time investment on Sunday (we’re talking 15-20 minutes! ), means you have a healthy and satisfying lunch for the working week! Couldn’t be any simpler. Portable and ready-to-go. When it comes to packing lunch, do you leave it to the last minute? Perhaps you struggle to come up with meals ideas or even forget about lunch altogether – and zoom out the door! 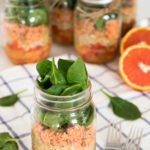 With this mason jar salad, there’s no fuss required in planning, assembling, and packing your lunch in the morning – or even the night before. These are totally grab n’ go and taste delicious! No more sogginess! So that you can actually eat your greens and enjoy them too! Properly layered mason jar salads means that your leafy greens never touch your dressing – keeping them crisp and fresh. The secret is in the order of the ingredients. Lots of room for creativity and variety. 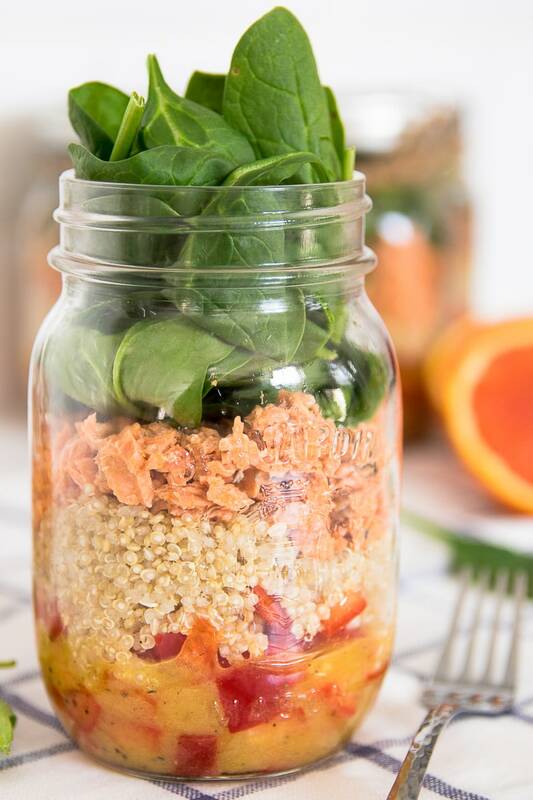 The best thing about making a mason jar salad is that you can swap and change-up the ingredients to brings variety to your lunchtime routine. Swap the salmon for another source of protein: tuna, beans, lentils, tofu. Add kale or lettuce to replace the spinach, and experiment with different whole grains to boost nutrition. The options are endless! Start by making the quinoa (Image 1). Rinse the quinoa thoroughly in cold water to remove the bitter flavor. In a medium saucepan, add water and quinoa and bring to a boil. Reduce to medium heat, cover with a lid and simmer for 10-12 minutes. The quinoa should absorb all the liquid. Allow to cool and set aside. Wash and dice bell pepper in bite-sized chunks and set aside (Image 2). Using fresh ingredients makes all the difference. You can use any color you prefer or even a variety of colors. Prepare the salad dressing in a clean dry mason jar (Image 3). Add all the dressing ingredients in the jar and give it a good shake to mix thoroughly. 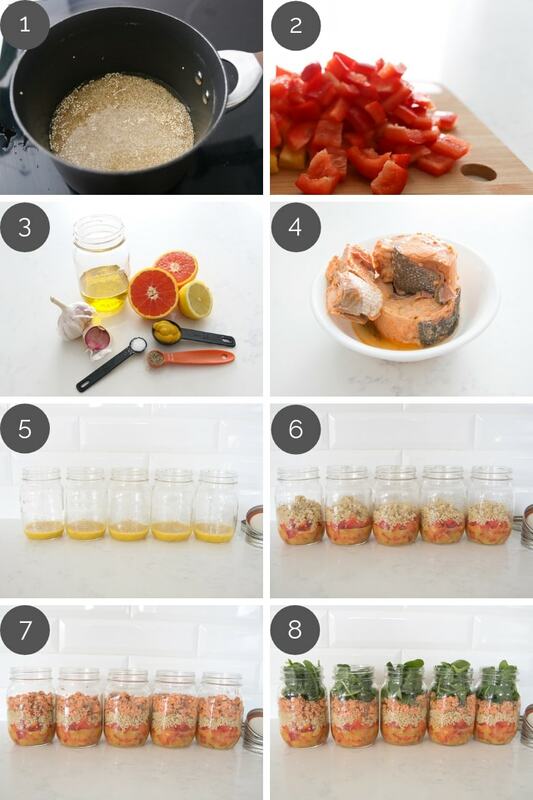 Drain the canned salmon and transfer to a bowl. Using a fork, gently mash the salmon, ensuring all the small bones are crushed. Wash and dry four 1 pint (16 oz) mason jars. If you want something slightly bigger, opt for the quart sized jar. 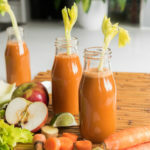 Divide the salad dressing equally amongst the five mason jars (Image 5). 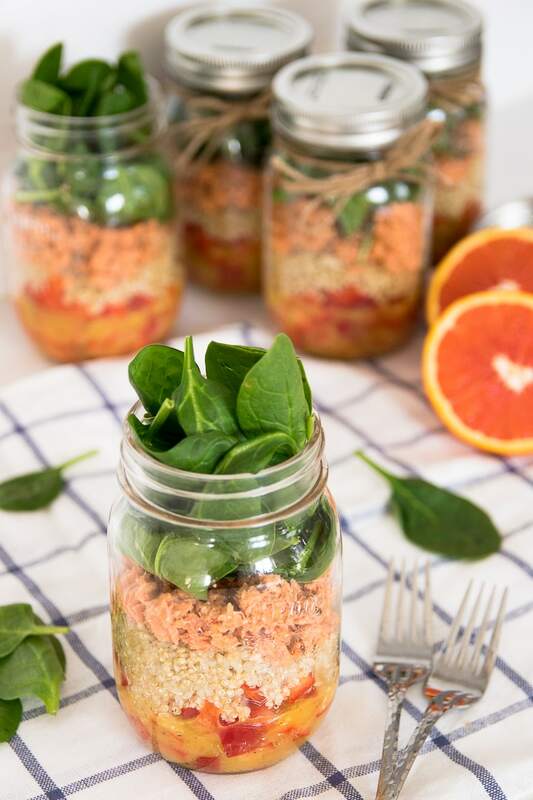 Divide the rest of the ingredients equally among the 5 jars, layering one at a time and starting with the red peppers, quinoa (Image 6), salmon (Image 7) and spinach (Image 8). The salad dressing is the first thing to go at the bottom of the jar. 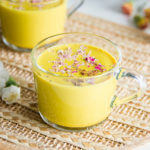 How much dressing should you add? That really depends on your preference. I tend to add at anywhere from 3-4 tablespoons. By keeping the dressing at the bottom, you prevent the leafy greens and other vegetables from getting soggy and mushy. Incorporate hard-er vegetables and fruits: cucumbers, peppers, radishes, broccoli, beans, tomatoes. These will stay sturdy even if they are touching the dressing. Continue to assemble the mason jar salad by adding the hard veggies and fruits. Add your favourite whole grain. This can be anything from quinoa to brown rice, potatoes, buckwheat, noodles…there are heaps of choices. Throw in your favourite protein: beans, lentils, chickpeas, nuts, seeds, fish, tofu, eggs. These will stay fresher nearer the top of the jar. Complete your salad with soft-er vegetables, fruits and green. Have you tried mason jar salads before? 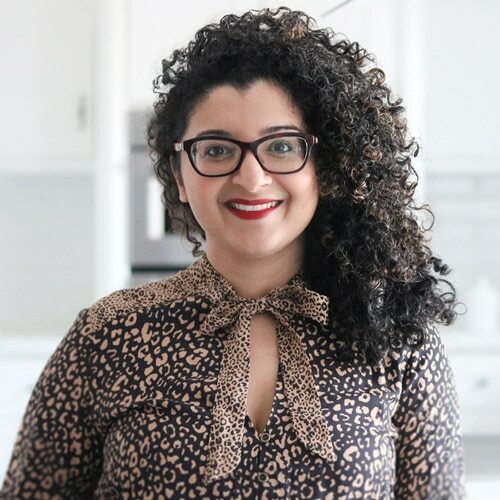 I’d love to know what’s your go-to lunch when you’re short on time? Leave me a comment below! 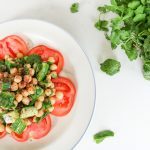 Looking for healthy low carb lunch ideas? 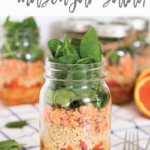 Learn how to make this make-ahead delicious salmon mason jar salad. With layers of colorful vegetables, heart healthy salmon, and fibre-rich quinoa - all made complete with the dressing of your dreams! Super easy, fresh and oh so satisfying! Combine the oil, orange and lemon juice, salt, pepper, garlic and mustard. Whisk until well mixed and slightly thickened. 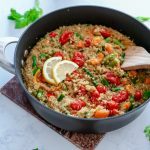 In medium saucepan add water and quinoa. Bring to a boil, then reduce to medium heat, cover with a lid and simmer for 10-12 minutes. Quinoa should absorb all the liquid. Allow to cool and set aside. Divide the dressing among 5 jars. 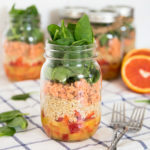 Divide the rest of the ingredients equally among the 5 jars, layering one at a time and starting with the red peppers, quinoa, salmon and spinach. Put lids on jars and store in fridge for up to 3 days. Pour salad onto a plate and enjoy.